Affidavits are important legal documents that are used as formal statements about a case. Using an affidavit requires the affirmation of people involved in the case as this document serves as the list of facts and evidences which you can present to court. Always be reminded that once you have filed an affidavit, all parties must receive the specified document. 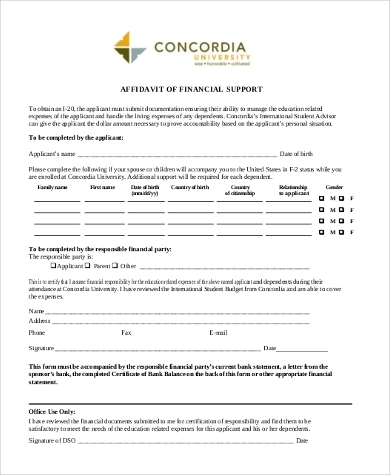 Our Affidavit Forms come in PDF format for your easy download and accessibility. You can choose from a wide array of our affidavit forms or download other affidavit templates through our other sample forms which are available in Word and in PDF formats for your easy access and convenience. Creating an affidavit should be based on actual events. It should not involve comments and opinions coming from the individual who made the affidavit, especially if the personal and unverified statements pertain to other entities involved in the case. If you want to make an affidavit, make sure that you will focus on the main factors that can affect your case. Your document will also depend on how complex the scope of your case is. Anyone who would like to make an affidavit is entitled to do so as long as it is necessary to support the case where they are currently involved in. One important thing that must always be remembered when making an affidavit is to never fabricate sworn information just to win a case . There are various purposes that an affidavit can be beneficial. Some of these purposes include divorce cases and property disputes. More so, there are simpler transactions that require the usage of affidavit depending on the reason on why it is needed which includes application for visa, settlement of debts and even on some cases of college admissions. Since an affidavit is considered as a legal document of high importance, it is suggested for affidavits to be created, structured, and reviewed by attorneys or legal counsels. There are also paralegals that can do the job especially if their area of expertise is relevant to the case that you are currently on. However, an ordinary person can also construct his own written affidavit, just as long as it has been notarized and contains real and genuine information. The affiant should then affix his signature onto the affidavit. 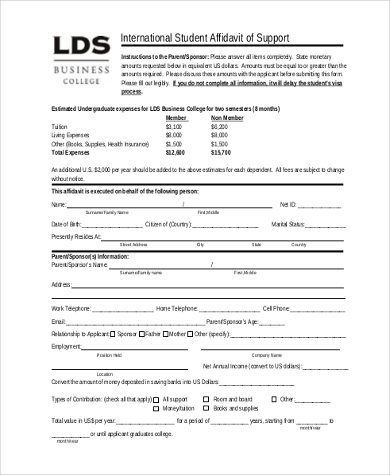 You can also view our Sample Relationship Affidavit Forms here. One should be aware that the statements declared by an affiant in an affidavit are considered to be statements given under oath and are used for verification purposes. This is the reason why it is very important to be reminded that an affidavit is a legally binding document and anything that is stated in it can be used as evidences for cases once proven accurate and true. 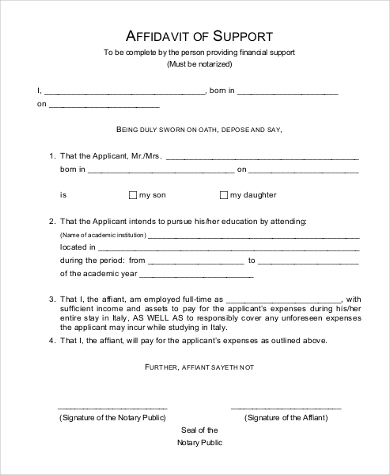 An affiant is also required to attach his/her signature in a willful manner. More so, an affidavit should be notarized. Any false statements incorporated in the affidavit are subject to perjury charges which may result to penalties, community service, and even incarceration. Financial Affidavit -A financial affidavit is usually required in divorce cases and child custody and/or support settlement. 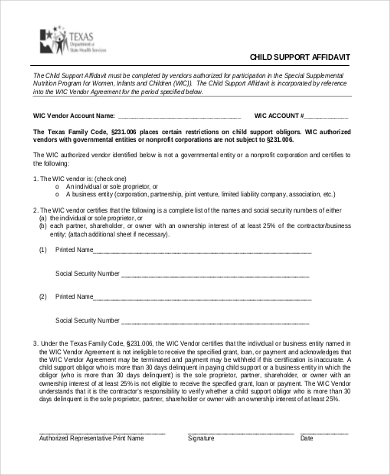 This document contains a simple statement about an individual’s financial status. 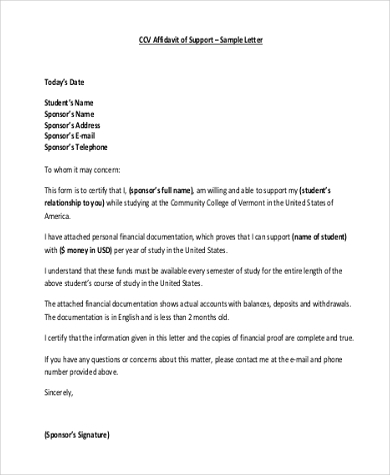 The information present in a financial affidavit mostly pertains to the person’s salary in a particular time period, material and monetary assets, and current savings. Identification Theft Affidavit – This type of affidavit is usually used in the event a person’s personal information or valid proofs of identification have been stolen or compromised. Affidavit for Small Estates – An affidavit for small estates is made to generally bestow the right to an individual to decide what to do on the estates of a deceased person. This document serves as a legal consent, commonly given to a family member, to either disseminate or appoint the usage of the assets left by a deceased person who has not made a will before dying. Affidavit of Death – An Affidavit of Death is especially useful or utilized in the process of notifying a company, an organization, or a government agency of a family member’s death. Affidavit of Name Change – If you are a woman who just got married, you need to create an affidavit of name change for you to have a legal record of your name change from your maiden name to the full name that you will already use after marriage. Affidavit of name change is usually used by employees who would like to update their records with their employers and government agencies to ensure that future transactions will not be affected by their change of name. Affidavit for Proof of Residency – This type of affidavit can be used in various processes where there is a need for a written statement that can testify or confirm the area of residency of an individual. 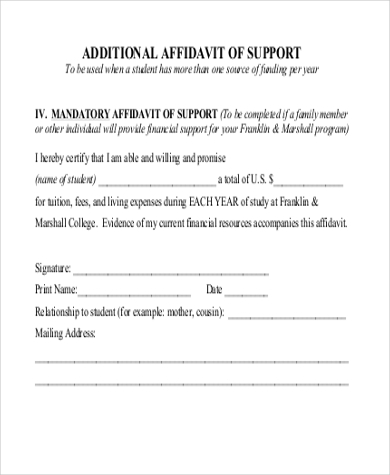 An affidavit for proof of residency is useful for employment, academic enrollment, and scholarship grant application. Affidavit of Truth – An Affidavit of Truth is a document that is served as prima facie evidence that stands at the truth in commerce. It is signed and sworn under penalty of perjury. It can be used as evidence in a court of law. 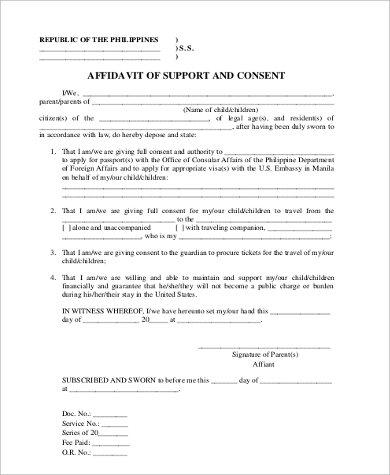 Affidavit of Support – A visa applicant who would like to go to another country can use an affidavit of support to confirm his/her ability to travel through the financial support of an American sponsor who will create or write the document. Affidavit of support is considered as a legal document which should be given to the government to provide information about the specified matter. 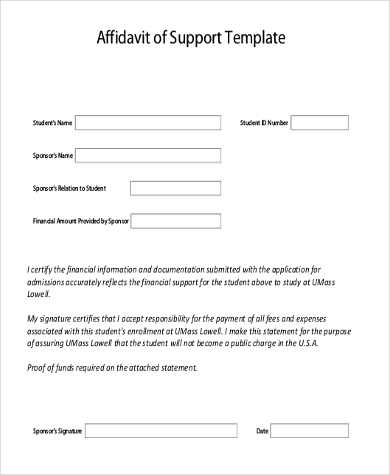 You can view our other Sample Affidavit of Support Forms and Sample Affidavit Forms through our website. Get access to an unlimited supply of free sample affidavit forms to help you cut costs on outrageous lawyer fees.